Artificial lights nurture seedlings, which could eventually improve Iraqi crop yields (Photo: Benjamin Plackett). DUHOK, Iraq—Farming can be a tough profession—many farmers in the Middle East and North Africa find it a challenge to make ends meet. Diaa Ayoub Ibrahim, an assistant professor of genetic engineering at the University of Duhok, in Northern Iraq, wants to use his research to make it a little easier for farmers to succeed. Ibrahim hopes to do this with a collection of seedlings and saplings that he cultivates in a small room on campus with no windows. 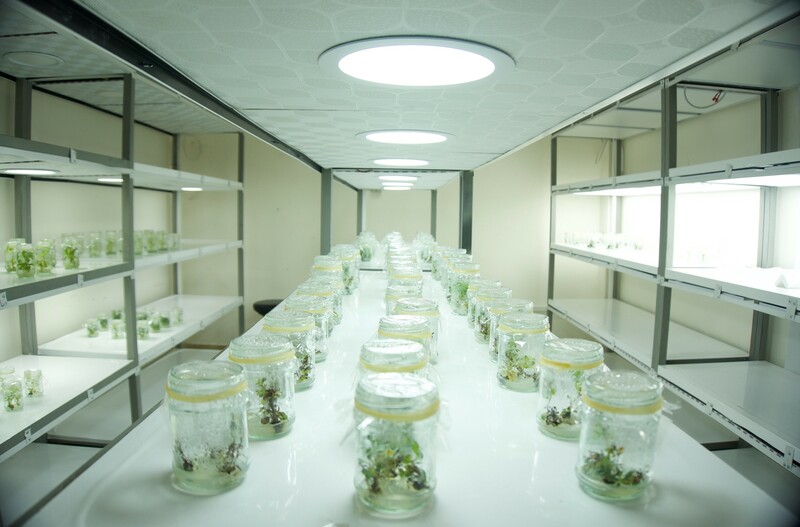 In his laboratory, he uses artificial lighting, precise doses of nutrients and a sterile environment to grow economically important crops. This “in vitro” propagation process is designed to weed out disease, boost plant numbers and decrease the time it takes to grow a plant to maturity. In the West it is not uncommon for farmers to buy plants or seeds produced in this way, which they then grow in their fields, safe in the knowledge that their chances of a disease-prone crop are reduced. It also means they can expect a yield from year one, whereas in Iraq and many parts of the Arab world, it can take years, depending on the crop, for farmers to get a yield if they grow the plants from the seed itself. “In six months, you could get 1,000 apple trees. To get that naturally could take 10 years or more,” says Ibrahim. Ibrahim takes plant tissue, sterilizes it to prevent infections and then cultures it with highly specific levels of vitamins and minerals. At various stages of the plant’s growth he will also add hormones to encourage proper growth. Getting the doses of vitamins and hormones right takes time; he’s done a series of trial-and-error experiments to perfect the recipe. “We test until we get the optimum protocol to produce the plants, and then we put them into the field stage, which is acclimatization,” he explains. When he has produced healthy plants, free from infection, he puts them in a greenhouse and gets them to flower and produce fruit. “Many big factories do this is in the West and they make a huge fortune,” he says. Yet Ibrahim could not simply copy Western procedures. So far, he has successfully propagated ginger, apples, pears and grapes in this way. He’ll keep going with other crops commonly grown in Iraq. Next on his list is the pistachio tree. Iraq has to contend with climate change and a water supply that’s increasingly difficult to predict. “We need to increase the efficiency of the farming process,” he says. One way to do that, argues Ibrahim, is to turn to in vitro propagation to speed up the development of mature crops and increase yields. 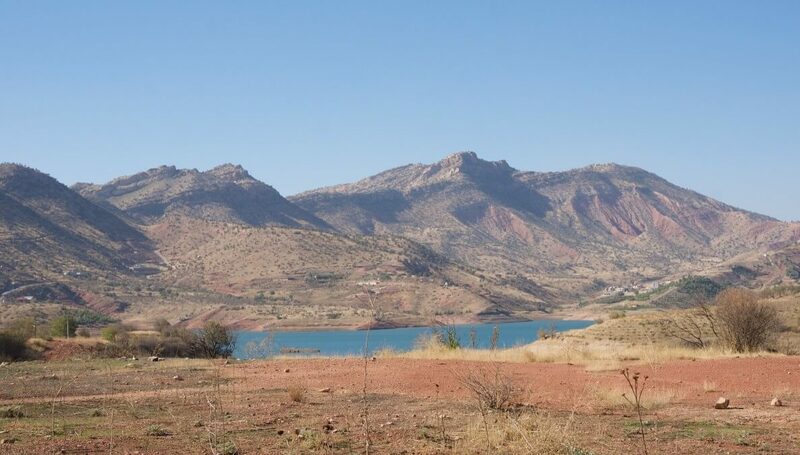 The director of the University of Duhok’s Scientific Research Center, Jaladet Jubrael, says the center is ready to share Ibrahim’s research with any agricultural businesses that would like to use crop propagation technology in Iraq. “We have the knowledge for the nutrient and hormone composition at each stage of the crop’s propagation if anyone wants to use it,” says Jubrael.